As a Sociolla blogger, I receive these beauty boxes containing beauty products sold at Sociolla. I always love their packaging box since it's so sweet and feminine. The quality of the box is also good, it's quite thick so the products inside won't be damaged. Though I can't seem to find the official website for this brand, I found some sources telling me that this brand is extremely popular in Asia, especially Japan and South Korea. In Japan, this brand is even publicly acknowledged in an interview by one of the famous Japanese actress; Norika Fujiwara. 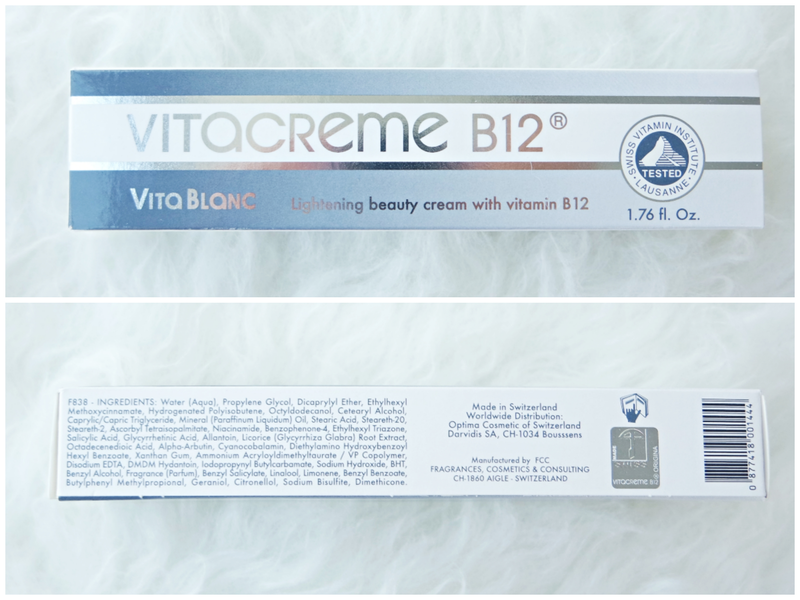 Vitacreme B12 has several products, from body care to skin care. And this time I'll let you know my journey with Vita Blanc Lightening Beauty Cream and Day Cream. The packaging is similar to toothpaste; both the box and also the tube. It has only one size; 50 ml. The tube is made of aluminum and in order to open it, we need to use the cap to poke. It's nice since it means that the product is safe and hygienic. It has simple design; dominated by white and light grey color. It feels luxurious somehow, which is good point. This product aims to create a bright and uniform complexion. This one is special care treatment which is enriched with UVA and UVB filters to protect skin from sun damages. So it's safe to use twice a day, as long as sunscreen is applied after that. Don't forget to massage delicately until it is absorbed completely. It possesses unique formulation which promotes a progressive lightening of the skin, without irritating. It tones down the pigmentation spots and prevents their development, evens the complexion and gives the skin a new luminosity and radiance. It is also 100% safe and mild. What's more? It's paraben-free (YAY!). It prevents melanin to form on epidermis layer. This one will help you to banish those dark spots and prevent the new ones to form. It is also non-toxic to the skin. This extract helps to treat and relieve inflammation and allergies efficiently. This ingredient is also suitable for sensitive skin and can be used to treat redness. It contains antioxidants and also helps to produce collagen. Vitamin C is also widely known to treat sensitive skin, acne, and hyper-pigmentation. The texture is runny, not too thick. It also absorbs fast onto my skin. It has light pinkish shade, but of course it appears transparent right after. I have dry to normal skin, and unlike any other beauty bloggers who said that this cream is too oily, mine is perfectly fine. I can use it both morning and evening without causing me any breakout or excess oil. However, if you have oily skin, I recommend you to use it only in the evening. 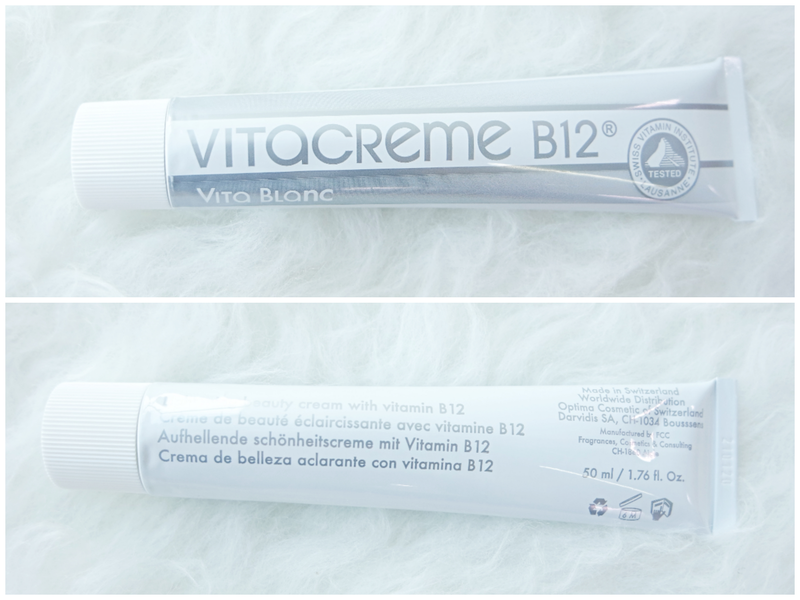 As you can see, right after using Vitacreme B12 Vita Blanc my face looks glowing, not oily. I've been using it for around three weeks, and actually my whole complexion gets better. However, I stopped using it for a week because I get that hormonal acne. I don't exactly know whether this product contradicts with active acne or not, but since I experienced that side effect (using whitening cream while having active acne), I avoid using this until the acne is gone. The result is noticeable, though not significant (I haven't finished the tube yet). My whole complexion is fairer and some of my acne scar and dark spots are reduced. Also when using it at night, in the next morning my face is more supple. And as I am very concerned with whitening, of course sun protection is essential. Sun protection acts as barrier between our beloved skin and UV rays. It helps covering our skin, thus preventing the melanin production which can lead to hyper-pigmentation. 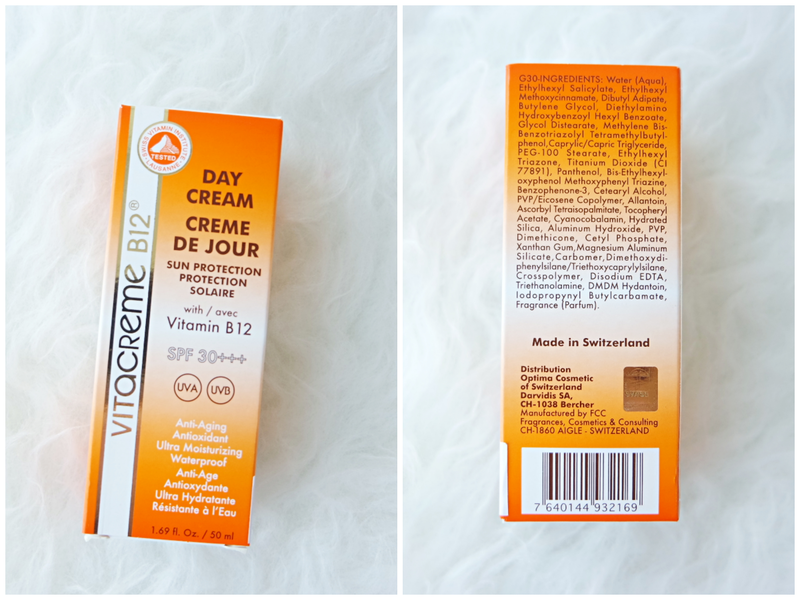 Vitacreme B12 Day Cream is formulated with combination of vitamins; B5, C, E, and B12 and UVA-UVB solar filters. It serves as anti-aging, antioxidant, and ultra moisturizing cream which is also waterproof (WOW). 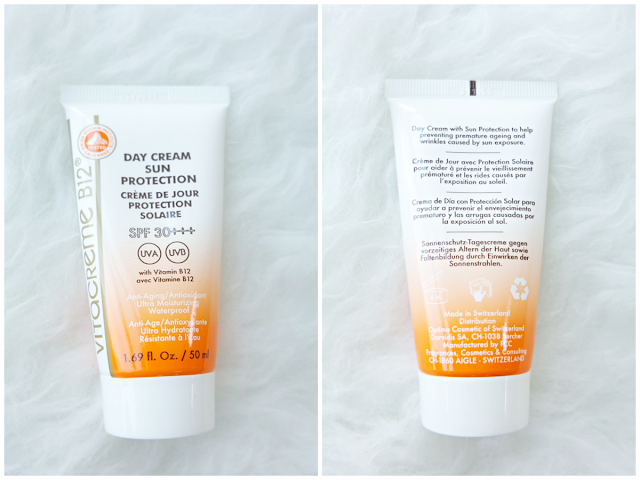 The packaging is a plastic tube packaging decorated with white and orange color. Similar to Vita Blanc, it is available only in single size; 50 ml. On the tube opening, the new product is sealed with sticker, keeping the product hygienic and untouched. Love this as well, but as usual I prefer airtight pump packaging since it is more hygienic. The unique combination of active ingredients keeps the skin well moisturized and protects it against the harmful effects of the sun. Also, this day cream helps to prevent early aging and wrinkles caused by sun rays due to the antioxidant in vitamin E.
It is perfect for daily use and can also protect the skin from pollution. Use it in the morning as day care, makeup base, and sun protection (preferably 15 minutes before going out). The texture is between runny and thick. Compared to Vita Blanc, it is slightly creamier. It's good to be used daily since it is not creamy and doesn't feel heavy on me. If compared to other sunscreen, I think this feels more lightweight. Usually I take around coin-sized cream onto my whole face (including neck) and it absorbs around 2-5 minutes before I can put on makeup. I also think this cream is slightly tinted as it gives a hint of color on me after I use it. 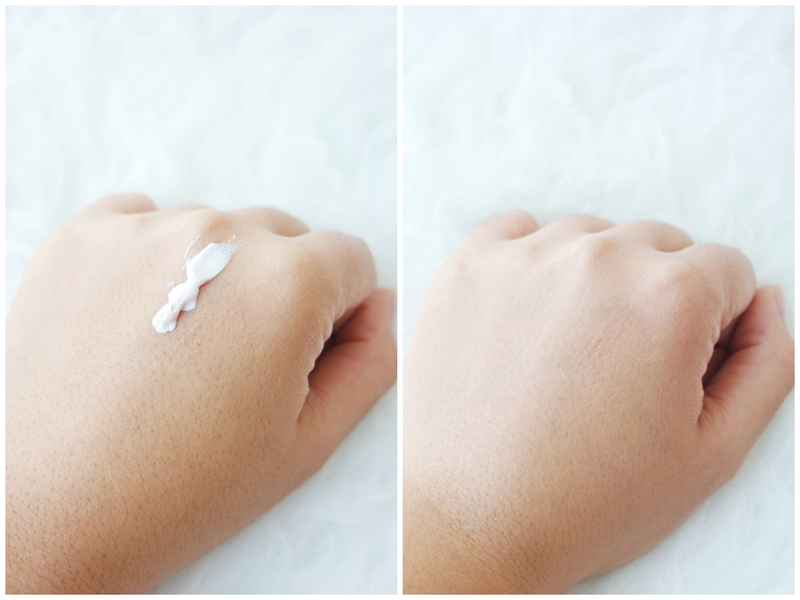 When I don't feel like wearing any makeup, putting only this Day Cream is just enough. It evens out my skin tone since it is tinted. But for daily use, this Day Cream is quite sticky and it takes a while for it to be fully absorbed. So make sure that you're not in hurry when you're using this unless you want to catch those dirt and debris outside (since it is quite oily). So far, after around three weeks using this Vitacreme B12 Day Cream, I don't experience any breakouts and it is one of my daily makeup staples! The only drawback is that this product is oily and needs a while to be absorbed before putting makeup. Thank you Sociolla for introducing me to Vitacreme B12! I hope you find my review useful and in case you want to shop at Sociolla, use my voucher code below to get Rp 50,000 off!